The fatigue life of alloyed bearing steels such as 100 Cr6 (or SUJ2 in the Japanese standard), for instance, depends principally on the inclusion content. 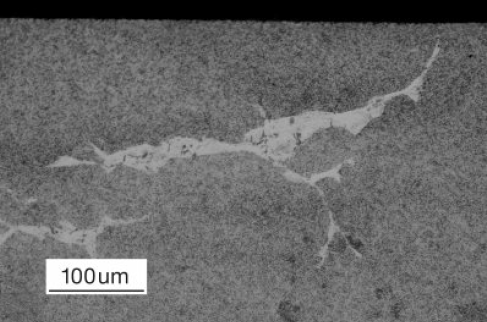 Oxide or non-metallic inclusions in particular, promote negative effects under the raceway surface. As an example, it is known that aluminium oxide inclusions, which are formed by the process of oxidisation during the melt, can lead to a major reduction in bearing fatigue life.This effect is created because aluminium oxide inclusions are relatively hard and can break up when the steel is being processed, such as during forging. When break-up occurs, the inclusions shrink and weaken the microstructure. Heat treatment is another parameter which impacts the specific characteristics of steels and consequently also affects the bearings. This fact is why materials such as NSK’s SHX steel are subjected to a specific heat treatment that is particularly resistant to wear at high operating temperatures. 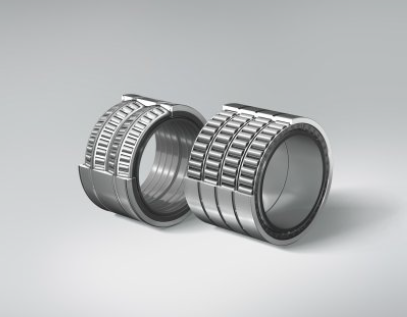 Bearings of this type are required not just where heat is present as an inherent part of the process, but in applications such as machine tools, where fast spindle speeds generate high temperatures in the drive components. Materials such as NSK’s Super Tough steel come from combining the optimum heat treatment with a special alloy (Image1). For instance, the hardening of steels using a process such as carbonitriding increases service life by a factor of two in comparison with the estimated service life under contaminated lubrication conditions. 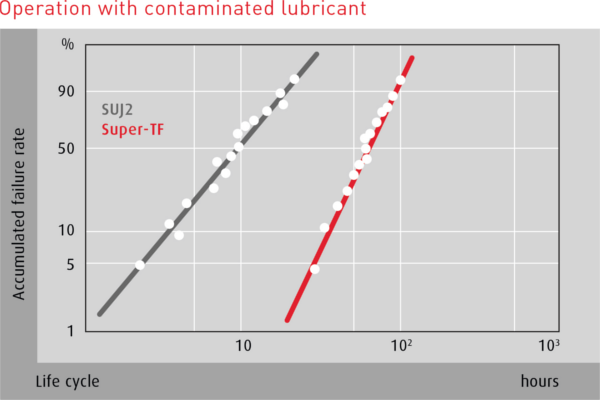 In environments where the lubricant has normal impurities, bearing service life can even be increased by a factor of 10. 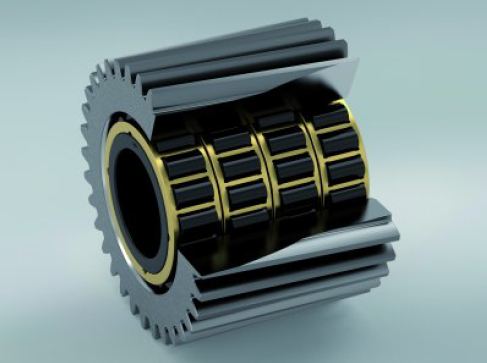 The reason for this improved performance is that surface-induced wear caused by insufficient lubrication or contamination of the lubricant is significantly reduced. In turn, any potential damage caused by ‘white etching cracks’ (WECs) is delayed. 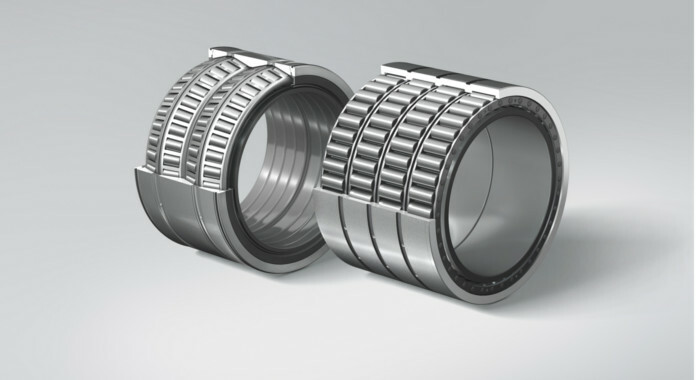 Another effective method of reducing the probability of WEC damage is the use of bearing rings made of NSK’s Tough Steel. 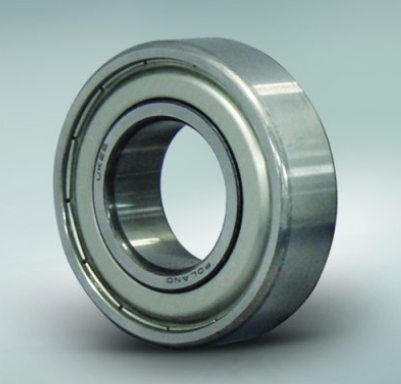 Using this combination of material and surface treatment, dynamic load rating can typically be improved by 23%, which in rolling bearings is equivalent to a doubling of fatigue life. 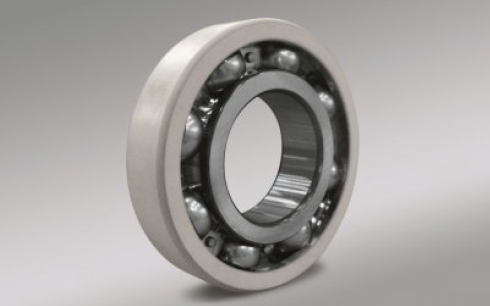 Another advantageous strategy is to use bearing rings made of ‘Anti-White Structure-Tough’ (AWS-TF), a proprietary NSK material that was developed specifically to prevent WEC damage. In an extensive series of tests, the operating life of conventional steel bearing rings was measured up to the moment when WEC damage was detected. Then, the test series was repeated with AWS-TF. After eight times more service life than the conventional steel bearing rings, no WEAs (white etching areas) were detected in the material. Próximo artigoBearingNEWS February issue is out! check-out your copy..